Hi, I am interested in your 1971 Chevrolet Nova (stock #5094-CHA) listed on Autotrader for $33,995. I'd like to get more information about this vehicle and confirm its availability. Novas make terrific muscle machines. 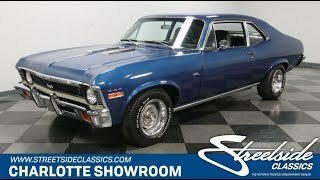 After all, this 1971 Chevrolet Nova already has the right look of intimidation, and thats before you even see the performance big block, upgraded suspension, and four-on-the-floor. Third-generation Novas are great cars. The fastback profile of the coupe combined with the SS-style blacked-out grille and tail panel instantly gives this appeal. Plus, the brightwork has a nice American muscle look with the louvered hood, mirror-like chrome bumpers, and Rally wheel package. And this coupe has been upgraded to a metallic blue paint that really knows how to highlight all the best curves of this super-straight body. The interior begins to show hints at the upgraded muscle car stature. There are newer high-back bucket seats that hug your body better than the factory units. Plus, you get a full set of AutoMeter Pro-Comp auxiliary readouts, a grippy NK4 steering wheel, and a factory tach thats especially handy with the Hurst shifter. But more than just a pure performance package, you also get some nice upgrades that are great for anytime use, like the comfortable center console w/cup holders. And theres a modern AM/FM/CD stereo tucked away in the glovebox. Youll never leave the hood down at car shows once you see the investment in the engine bay. The 454 cubic-inch V8 looks fantastic with the bold block paint, polished valve covers, and matching air topper. But the real appeal is that you can also instantly see this big block was upgraded for serious power. It includes a large Edelbrock 800 CFM four-barrel carburetor, Edelbrock aluminum intake, and long tube headers that feed a growling dual exhaust. Plus, this has the right supporting components like an MSD ignition and aluminum radiator. Best of all, you are in complete control of this big block and its thunderous soundtrack thanks to the four-speed manual transmission. Getting all this power to the ground is easy thanks to a reinforced setup that includes frame connectors and a ladder bar rear end with diagonal link. Theres even power steering and front disc brakes for good control. Complete with the owners manual, all you have to do is check out how clean the undercarriage is to understand the total level of investment in this big block Nova. So if you love a turn-key muscle machine, dont delay. Call now!